President Uhuru Kenyatta will on April 30 lead Hollywood celebrities, business moguls, Heads of State and other world dignitaries in a historic burning of the largest ever ivory stockpile in an effort to end poaching. Among those in attendance will be Hollywood actors Leonardo DiCaprio and Nicole Kidman, businessmen Paul Allen, George Soros, Michael Bloomberg and Howard Buffet. Other international celebrities set to jet into the country for the anti-poaching exercise are multiple Grammy award winner Elton John, former basketball star Yao Ming and BBC legend David Attenborough. Kenya Wildlife Service Director Kitili Mbithi stated that the stockpile to be destroyed consists of 105 tonnes of ivory and 1.35 tonnes of rhino horn. The fire is expected to be eight times the size of any other ivory stockpile that has been destroyed so far. On march 30, the Kenyan government issued a 21-day amnesty for people to surrender any wildlife trophies they were holding without a Kenya Wildlife Service permit. Environment Cabinet Secretary Judi Wakhungu urged Kenyans to take advantage of the amnesty period and hand over ivory, rhino horns and any other wildlife trophies, jewelry or trinkets made from those materials, stating that they would not be punished. 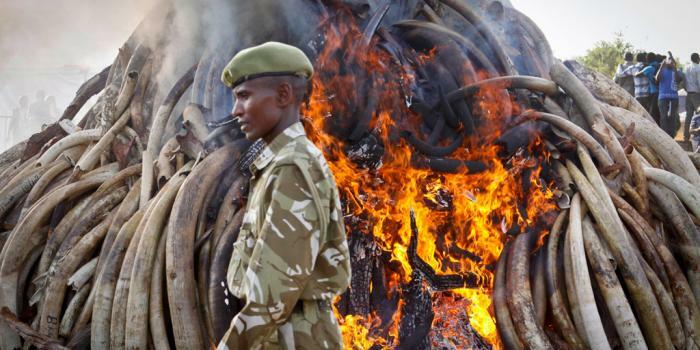 In march 2015, President Kenyatta set fire on 15 tonnes of elephant ivory with a black market value of Sh3 Billion (30 Million dollars) which was at the time the largest consignment to be destroyed in Kenya.